It’s the season your kids have been waiting for, so how will you maximize the long lazy days of summer with your family? Celebrate the carefree season to its fullest with these outdoor activities and adventures your whole family will enjoy. Trail blazing. Head to a local park and make a day of nature hiking. Before you go, make a list of things for your family to find and identify, such as a frog, a garter snake, or a raccoon paw print. Carry a backpack with binoculars, sunscreen, visors or sunglasses, and plenty of water and snacks. Find places to hike in our Resource Guide on pages 23 and 26. Ride ‘em, cowboy. You don’t have to be a horse owner to enjoy the pleasure of riding one of these majestic beings. Visit a nearby stable that offers horseback riding and take a tour. Make sure your child is provided with a helmet before you ride. Z is for zoo. Summer wouldn’t be summer without a trip to the zoo to look at the wild animals. Check the schedule for animal presentations, and don’t miss the petting zoo where youngsters can walk and talk with the animals and feed them from their palms. The strawberry patch. Perk up those taste buds with fresh picked strawberries, which will soon be in season. Round up the family and head to the strawberry patch for a day of fruit filled fun. When you get home, try out our Strawberry Dessert recipes on page 9. Big wheels and small. Biking trails are popping up in parks, along waterfronts, and in forested areas. 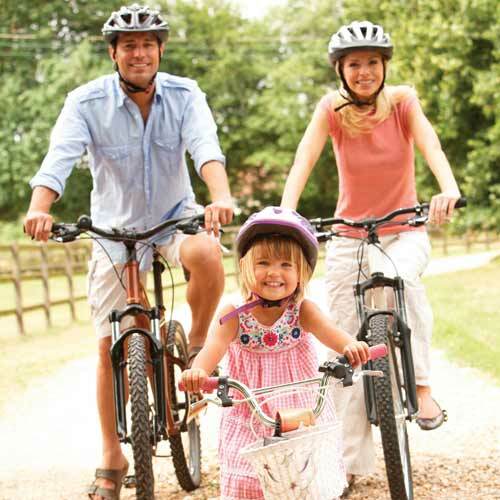 Pull out your bikes and trikes, and take a spin with your family to enjoy the outdoors, spot birds and other critters, and spend quality time together. Beach bumming. 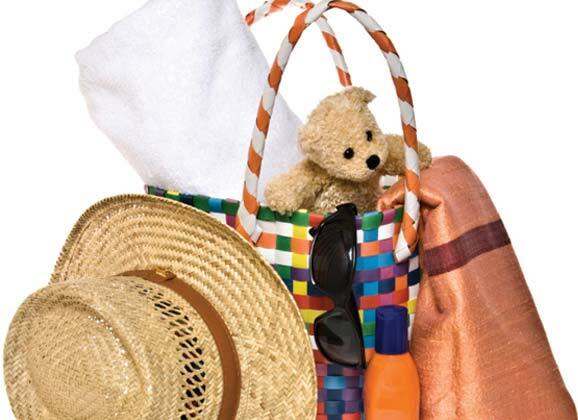 Load up the kids, beach balls, buckets, and blankets, and get ready for a day at the beach. For added fun, take along goggles, snorkels, and fins for underwater exploration. Don’t forget the sunscreen and umbrella. Waterpark fun. Spend a smoldering summer day chilling off at a water wonderland where your family can swoosh down waterslides, catch the man-made waves, and tube around narrow canals. Before you go, ask about age and height requirements and what activities are available for the younger set. A trip downstream. Canoeing is a fun-filled family adventure for all ages. Look for canoe rentals on a clear river or lake and take a cool dip when the day heats up. Give kids plenty of opportunities to paddle and steer. Putt around the lake. You don’t have to live on a lake or even own a boat to enjoy this luxury. Contact a nearby marina, lakeside store, or resort to find out where you can rent a pontoon or motorboat for a cruise around the lake. Under the stars. Take full advantage of the peaceful summer nights and camp out in your backyard. Kick off the evening by watching the sun set, then build a bonfire (if it’s permitted in your area), roast marshmallows, and gaze at the stars. Bring out your guide to the stars and see what you can spot: the Big and Little Dipper, Cassiopeia (shaped like a W), and more. Up, up and away. Is the wind hampering your fun? It won’t be for long. Make the most of that breeze, and get your kite up in the air at a local park or beach. Find out how to make some simple kites at www.LocalParent.ca/kite-making. Get in the game. 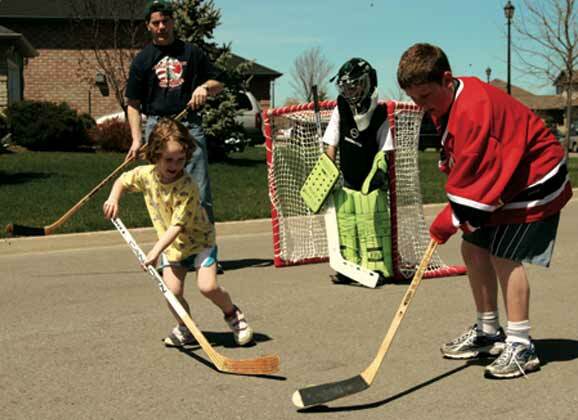 Organize backyard games for kids in your neighbourhood. The whole family will have a ball putting on this event. Pick a theme that kids will love and decorate accordingly. Serve snacks and lemonade. You’ll find some fun ideas for games, such as tin can toss, sailboat race, obstacle course and more at www.localparent.ca/backyard-games. Green thumbs. Make summer gardening a family affair. Ask each member to choose a favourite vegetable to plant. If you’re getting a late start, look for starter plants that have already sprouted. Work together to get the garden ready and plant it, then give each person his or her own responsibility for keeping it up: watering, pulling weeds, picking ripe produce, cleaning it and preparing it to eat or store. Dancin’ in the street. Summer abounds with fairs and festivals along waterfronts and in the streets. Enjoy live music, new foods, boating and ski shows, magic acts, and arts and crafts. Look for upcoming festivals in our Community Calendar on page 29. Summer sights. When it comes to travel, Ontario is full of places and things to see in the summer – from checking out the big city with its art galleries, museums, and sporting events to viewing the wonders of nature from sand dunes to waterfalls and never ending shorelines. For more ideas, and lists of resorts and hotels, and other places to stay, head to www.ontariotravel.net. Performing arts in the park. Unwind listening to a summer concert in the park or taking in a movie under the stars. Check out our Community Calendar on page 29. Coasters, cars, and ferris wheels. A trip to a theme park can be the highlight of the season. If your children are at different ride levels, invite another family or two with children similar in age to your own. Then divide up so everyone can get the most out of the day. Batter up. Family fun centres offer a variety of recreation for the whole family. Get ready to practice your batting swing, speed around the race track, bump another boat, or have some wacky golfing fun. Beach Bag Basics On the Move The Ultimate Camping Greenhorn Happy Family-Friendly New Year! Kimberly Blaker is an author and freelance writer.